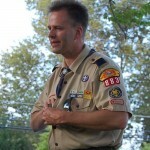 Let’s give a great “BIG HAND” to our Pack Trainer and Unit Commissioner (and former Assistant Den Leader, Den Leader, and Committee Chair), Mark Crampton. Mark was honored at a reception on Tuesday night with the District Award of Merit and the District Commissioner Award for his selfless service to Carroll District. This was (hopefully!) a surprise for Mark. 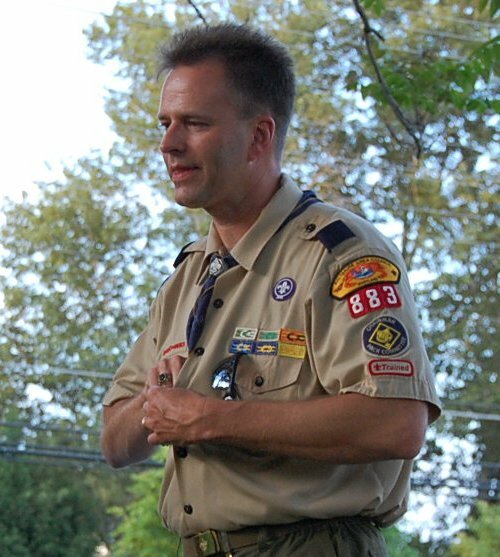 Please take a few minutes to say “Thank You” to Mark for his service to Cub Scouting and “Congratulations” on earning these awards. The Raingutter Regatta is similar to the Pinewood Derby or the Space Derby except that the models are miniature sail boats. Although the seas are only 10-foot lengths of rain gutter filled with water, and the ships a mere 6 inches long, the race is a very exciting event. Each boy builds his own boat with supervision and help from parents or other family members (done just prior to the races – all materials are provided). He also provides the wind for the sail with his own lung power. Please direct any question to Doug Hirth, our activity leader, at jd.cm.hirth@verizon.net. A special thank you to the folks at The Brickman Group, a large commercial landscaper, for donating time, materials, and expertise to plant new plants and flowers in the flower beds at the entrance to the church. This was a service project the Pack undertook at the request of the church, and Brickman really stepped up to help! Initially, they donated almost $250 worth of plants and the labor to prepare the flower beds for the Cub Scouts to do the planting. However, with the torrential rain yesterday, they ended up just planting the plants themselves – which kept 40 moms from screaming at me about how muddy their Cub Scouts were! It looks like it’s going to rain throughout the day today and into the evening. The Pack Meeting will go on as scheduled – we just might have to “picnic” inside. We start at 6:00 PM, but we could use some help between 5:30 PM and 6:00 PM to set up the gym for the picnic and the Pack Meeting. In terms of the flag retirement, we will try to hold that outdoors tonight, but we may postpone it until the September meeting if it is really raining when it is time to start the ceremony. The planting service project will go on – rain or shine – since the beds are being prepared and the plants are being delivered this afternoon. Please dress appropriately, and please bring a trowel and gardening gloves if you have them.